Call it the Apple crime wave. In a somewhat twisted reflection of how popular the tech giant’s sleek devices are, there’s been a disturbing increase in what’s called Apple picking – thieves stealing iPhones, iPads, iPods, and other covetable Apple gadgets. The latest incident happened on New Year’s Eve when four masked thieves swiped $1.3 million worth of devices from Apple’s (AAPL) flagship store in Paris. The armed robbers attacked the store three hours after it closed and, according to news reports, police said the heist was coordinated to take place as city police dealt with large crowds building up for the New Year Eve’s celebrations on the Champs Elysee and by the Eiffel Tower. The thieves stole almost no cash. In November thieves stole more than $1.5 million worth of Apple products from a cargo building at New York’s JFK airport, using one of the airport’s forklifts to load about 3,600 new iPad minis into a truck, according to the New York Post. And last week New York City Mayor Mike Bloomberg was eager to tout that the city ended 2012 with an all-time low murder rate. It saw the fewest number of homicides (414) and the fewest number of shootings (1,353) in recorded New York City history. 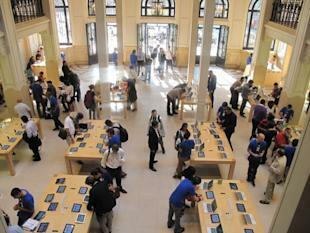 But an increase in iPhone and iPad thefts was blamed for the slight uptick in New York’s overall crime rate. According to a New York Times article, police recorded 3,484 more major crimes as of Dec. 28, 2012 than for the same period last year – while Apple product thefts increased by 3,890. The fact that they’re small, lightweight and used so openly make iDevices easy targets for thieves and pickpockets. “The devices are essentially a fashion accessory,” says Israel Ganot, CEO and founder of Gazelle.com, an online marketplace where people can sell their used devices. Apple products – and iPhones in particular – “preserve their value in the secondary market like no other device – that’s crux of the issue. They hold up their value well,” Ganot says. Last June thieves drove a car through the side of a Best Buy store in Chicago and stole $10,000 worth of Apple gadgets. A similar burglary occurred in October when six suspects targeted a Best Buy store in Ocoee, Fla., and got away with nearly $40,000 worth of iMacs and iPads. And around the same time burglars stole about $70,000 worth of Apple stuff from a Best Buy in Alabama. The Federal Communications Commission said last year that more than 40% of all robberies in New York City involve smartphones and other cellphones, while in Washington, D.C., 38% of robberies in the city involve cellphones. Other major cities are seeing similar statistics, the FCC said. When the iPhone 5 came out last September, the NYPD encouraged consumers to sign up for its Operation ID program in an effort to fight the rampant theft. The service registers a new device’s serial number along with the owner’s name and contact information in case it gets stolen and then recovered by officers. On its web site Apple says it doesn’t have a process to track lost or stolen products, but it advises customers to report them to the police. The FCC has gotten involved as well. In November it announced an initiative by wireless carriers, including AT&T, T-Mobile, Verizon and Sprint to create a blacklist. The companies plan to implement a joint database to prevent the use of swiped phones. When an individual’s phone gets stolen, they report it to their carrier, who will block the device from being used again. Not only is there a strong resale market for old Apple devices, but the black market offers a profitable opportunity for thieves who can unlock or “jailbreak” the phones as well. But the real demand for high-end smartphones isn’t in the U.S. The demand is “insatiable in emerging markets – places like China, Southeast Asia, Africa, Latin America. Everyone wants an iPhone, and most of the consumers in those markets can’t afford a new iPhone,” he says. For instance, Ganot says, a new iPhone 4S can cost as much as $1,000. So a used model that costs $400 or $500 is a deal. For its part, Gazelle in November partnered with CheckMEND, which compiles data on second-hand electronics from wireless carriers, data providers and the FBI. “Every time we get buy a product, it goes through a screening to make sure it’s not stolen,” says Ganot. But for it to work, consumers need to report the devices when they’re stolen so they’ll get registered in CheckMEND’s database.